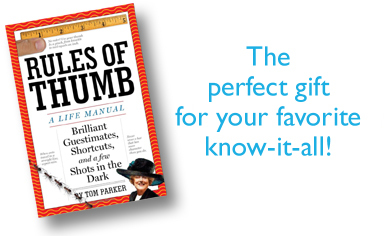 Featured Rule of Thumb Surprise Me! When daffodils bloom, sow tomatoes, cabbage, and lettuce indoors. Rate these new Rules IN or OUT of the Main Collection! Boarding one horse for a month provides as much income as one lamb a year. Every 2 tons of trash burned instead of thrown in a dump generates roughly 1 megawatt of energy which can provide power to 45,000 homes for 1 day. WHEN IN DOUBT, TAKE THE GARBAGE OUT. One major item missing from on-line dating questionnaires pertains to their temperature comfort . If there is more than a 5 degree difference between a couple’s high and/or low temperature comfort zone, forget about a long term relationship. If you’re experiencing snowmeggedon (and who isn;t this time of the year? ), wait until a main or secondary street is plowed and then move your car from your side street to one of those streets. Then, when the plow gets to your street - you have a clear parking space! If a person has a whorl (hair growth origin in the back of head) on the left, then right-handedness is more likely. If the whorl is on the right, left-handedness will be present in excess. To execute a relaxed and well-aimed high-five that works every time without awkward misses, focus your attention on your fellow celebrant's elbow, not his or her hand. You can never accomodate everyone's wants & needs.